In honor of Hispanic Heritage Month, a period when Americans recognize and honor the many invaluable contributions of the Latino community, Immaculate Heart’s Spanish Club board hosted weekly activities for its members. To begin the celebration, the Spanish Club hosted a karaoke activity in which members sang along to many upbeat Spanish songs. Among these songs were “Vivir Mi Vida” by Marc Anthony, “La Camisa Negra” by Juanes, and “Baila Esta Cumbia” by Selena. Students also sang and danced to “Danza Kuduro” by Don Omar, which was last year’s Mary’s Day Lawn Dance song! Secondly, students celebrated cinema latina. They viewed two award-winning short Spanish films: Niebla, an animated short by Emilio Ramos, and Tiempo, by award-winning director Carlos Mostaza. While watching these films, Spanish Club members enjoyed hot popcorn as well. 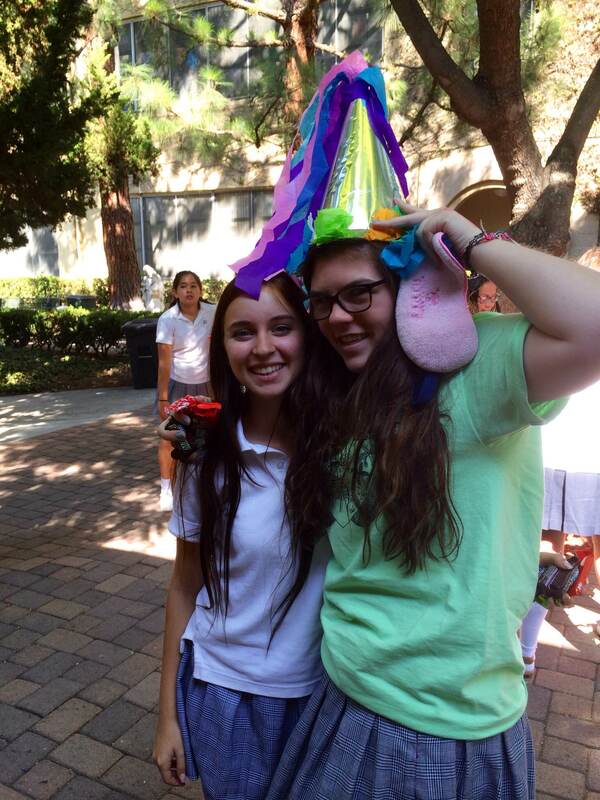 To culminate the festivities with a bang, the last activity that Spanish Club hosted was a piñata activity. Before breaking two piñatas, the Spanish Club board gave a presentation to students about the history of the game. Many did not realize that the participant who hits the piñata represents faith, which is the force that goes against evil. Because faith is blind, the hitter is blindfolded. Members of the crowd either assist the hitter by yelling “Higher!” or “Lower!” Others mislead the hitter by giving him or her false instructions. The stick represents virtue, and the piñata itself represents hope and charity, since participants share goodies after the piñata breaks. Have you noticed that many piñatas have seven colorful points with streamers attached to them? These seven points in this traditional design represent the seven deadly sins. 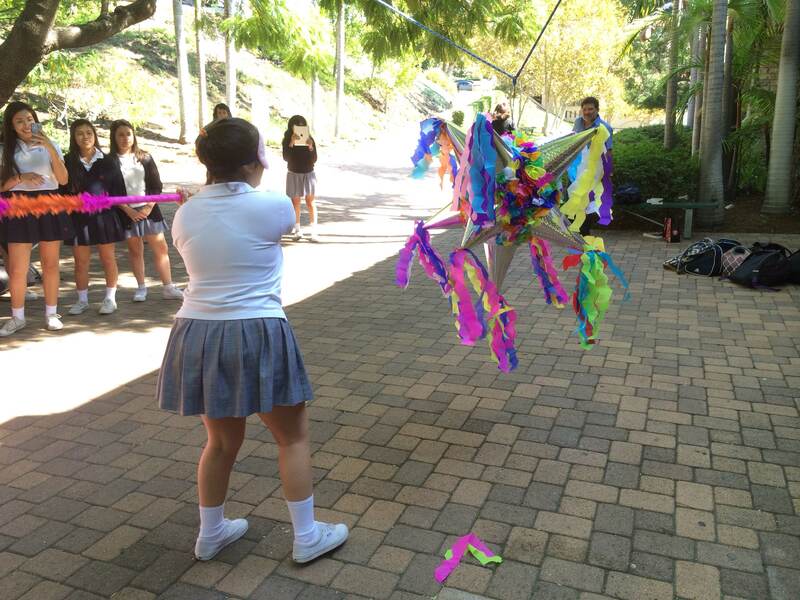 For this Spanish Club activity, both a traditional piñata with seven points was broken, as well as an adorable pink horse-shaped one. Immaculate Heart’s Spanish Club also prepared for the Dia de Los Muertos (the Day of the Dead) by hosting an event where students created candleholders, colorful skull masks, and vibrant paper flowers for the altar in the school chapel. This holiday, which celebrates the deceased, is observed from November 1st to November 2nd. Students were also invited to bring in photos of loved ones who have passed to place on the altar.